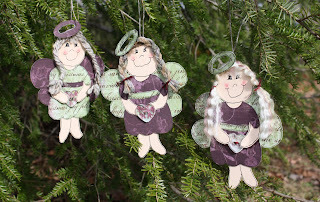 Welcome to the Epiphany Crafts Design Team Holiday Ornament Blog Hop 2010!! If this is your first stop please click here for the first stop on the hop. Our lovely Design Team has created some wonderful holiday projects, brimming with inspiration and of course, Epiphany Crafts epoxies, buttons, and tools! Visit each Design Team members blog to see what inspiring projects they have to share. Leave a comment on each blog. When you reach the last blog, you'll receive the final instructions on how to enter to win a fabulous prize pack filled with Epiphany Crafts goodies, straight from Santa!! Today I am sharing with you how to create an angel. I used a die cut from My Minds Eye as a pattern and added arms so she could hold the heart button that I made in the Epiphany Crafts Button Studio. Leave a comment here on my blog for your chance to win your choice of one of the three. So head on over to Samantha's blog to continue on the Hop. Don't forget to comment on all the blogs to be eligible for the prize at the end. Have fun hopping! THOSE ARE ADORABLE,THANKS FOR HOSTING. 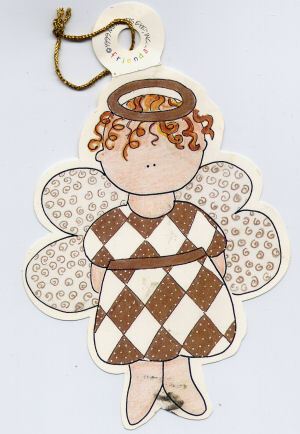 Cute...I love angel ornaments and have a huge collection of them. This is absolutely adorable. I collect angels! The hearts are perfect for this! What a fabulous idea! I have a few of these, can't wait to get started! Your angels are adorable. Love those hearts. Adorable ornaments! They are so cute! Adorable these are!!! Great project idea! I love angels... thanks so much for the inspiration! These are so stinking cute-I have to get the heart button maker now! These are so super cute!!! Love them Joy! they are the cutest little angels ever! Cute little angels . . . The season is not complete without angels...and these are so cute ! Those are the cutest Angels, thanks for the creative ideas. Love the heart in her hand!!! What a cute little angels! those are soo cute, love the real hair!! I'm lovin' these lil angels...thanks for sharing!! Joy you always do a wonderful job with your creations! Love the angels! those are so adorable, Joy! !